Potatoes have to be one of the most versatile and loved things to eat on the planet (or at least in the Western Hemisphere). Fried, boiled, baked or even grilled (yes, they can be made great on the grill), whatever the preparation – they are delicious when made right. They're also one of just a few items that can be cooked in the microwave and you would never know it. On a plate they are usually a compliment to the main course but they can often steel the show. Kind of like Robin to Batman. I still like to eat at McDonalds. Why? The Big Mac? Nope. Quarter Pounder? Nope. The fries are stupid good, best in of the fast food world as far as I’m concerned. I love them. And will likely eat at McD’s from time to time for as long as I live. Now that I have gotten that out, it time to get down to business. 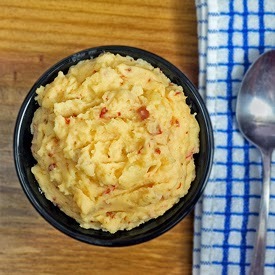 Potato recipes are some of the most popular posts on this site. 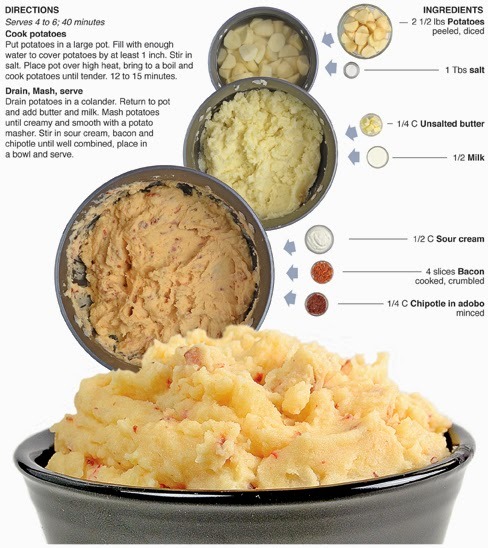 So every once in a while I like to get creative with the spuds and share it on the interweb. 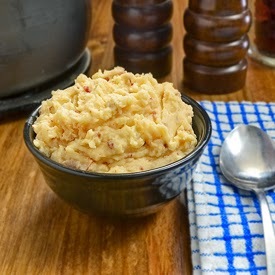 For this recipe, I use bacon and chipotle pepper to add a smoky fire to some extra creamy mashed potatoes. And yes, I devoured the s**t out of these! I have documented well over 300 recipe in information graphic form since I began doing it 4 years ago. In that time, I have created a digital pantry of ingredients that I can re-use in recipes. I am trying to get my staple ingredients, like minced chipotle pepper, shot in every amount from teaspoon to quarter cup. That way when I use it in the future I don’t have to re-shoot it. I just get it from the digital pantry, much like I do when I’m actually cooking. The prepped ingredients in this recipe are from the there. The bacon and potatoes needed to be shot because I didn't have those amounts photographed. All other shots were taken as I cooked and presented the recipe. Here is the catch though. The digital pantry made this a quick recipe to turn around, but ironically, I have been sitting on it for a couple of months! So much for quick turn around. Still, I’m glad to finally be sharing it. Put potatoes in a large pot. Fill with enough water to cover potatoes by at least 1 inch. Stir in salt. Place pot over high heat, bring to a boil and cook potatoes until tender. 12 to 15 minutes. Drain potatoes in a colander. Return to pot and add butter and milk. Mash potatoes until creamy and smooth with a potato masher. Stir in sour cream, bacon and chipotle until well combined, place in a bowl and serve. 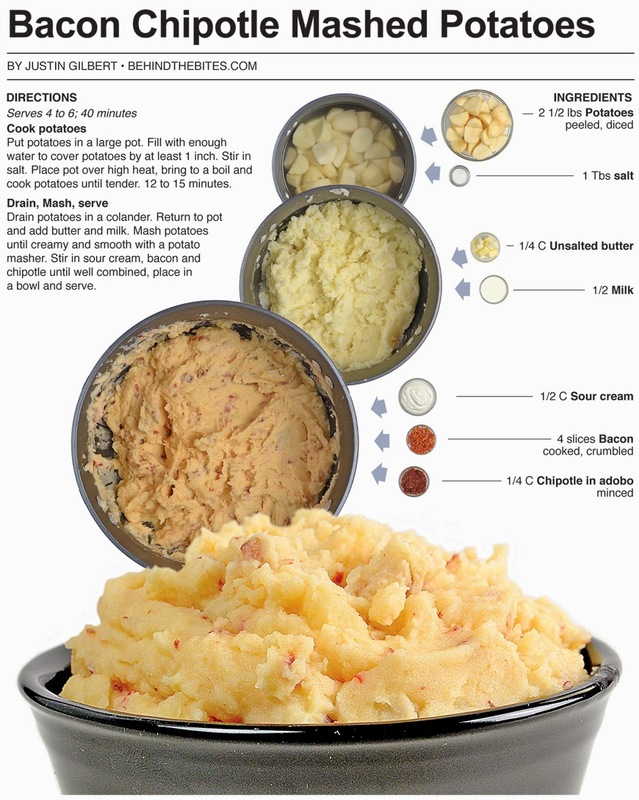 Made these tonight, best mashed potatoes ever!